Knuckles the Echidna 3 is the third issue of the Knuckles the Echidna comic. It was originally part 3 of a three issue mini-series, until the series was expanded to a full comic series. This comic features one story: "The Dark Legion - Blood is Thicker". Continued from Knuckles the Echidna 2. The Chaotix, standing in a clearing in a forest on the Floating Island, are facing a rampaging group of locals, who are escaping a wall of fire, by the Dark Legion, which is following them. In order to help the locals, Knuckles formulates a plan to prevent them from getting trampled and to stop the wall of fire. He orders Mighty to knock down a large tree to divert the rampaging locals. Using all his strength, Mighty causes the tree to fall, just as the locals arrive and run aside. With the locals out of danger, now the Chaotix must focus on the wall of fire or they will get charred. Knuckles looks over to Vector, asking him to take off his headphones and to set the volume to the max, using the sound shock wave to put out the fire. While Vector prepares his headphones, the others take cover and muffle their ears. He takes aim at the fire and plays Sonic Boom at max volume. The other Chaotix hold on tight while the shock wave propels the fire back at several nearby Dark Legion members. They try to escape, but can't, getting hit by both the fire and the shock wave of the music. In the past, some time after Edmund's death, the Dark Legion were quick to prepare a civil war with those following the magistrate of Echidnapolis. With war a great possibility, the magistrate and other members of Echidnapolis have no idea what they should do, especially since they have denounced technology. At that moment, Steppenwolf steps into the council chambers, announcing that there is no reason to despair. Before he can explain, guards quickly gang up on him as another echidna, Garek, blames his family for the mess they are in. He pulls out a pistol and aims it at Steppenwolf, intending to help end the conflict with the Dark Legion by giving them his head on a platter. Steppenwolf remains unphased, walking into pin-point range of the pistol, asking Garek to pull the trigger if he believes that is the best idea for him. He then tells Garek that he gladly give his own life up for him. The act of compassion becomes too much for Garek, who quickly gives his pistol to Steppenwolf and succeeds to him. Steppenwolf then turns to the other members in the council, telling them that their society and way of life is threatened because they have not found a way to deal with what fate has given them, resulting in a fractured society. While he helps Garek up, he tells him and everybody that they must develop a bridge between the two groups to ensure the survival of their race. He walks out of the chambers, telling the members of the council that if he doesn't return, there is always more than one option to every problem. The words of Steppenwolf reestablish the magistrate's confidence, who tells the council that Steppenwolf is an example as to how they will overcome the difficult conflict between them and the Dark Legion, offering their best support to him. With the group of Dark Legion members dealt with, the Chaotix decide to take a look at the damage they have dealt. They arrive at ground zero for the fire attack, finding a ton of Dark Legion technology. Witnessing all the technology they have, the Chaotix realize a frontal assault on them would not work, and that a strike from the inside would be the best idea. They grab some of the functioning Dark Legion pods and don Dark Legion cloaks from some of the fallen members. Charmy wants to join by wearing a cloak, but because of his size, Knuckles tells him that it would be best for him, so he hides in Espio's cloak. With their disguises on and the pods set up, they set a course for the Dark Legion base of operations. As they approach the base of operations, the pod detects numerous bogeys ahead. They then look ahead, noticing a large mechanical base in the middle of a forest on the island. As they approach the structure, Knuckles can't believe what he is seeing, thinking that no help whatsoever could aid them in taking down the structure, and wondering how such a base could be built without anybody's knowledge. Back in his base, Knuckles' father Locke, with Archimedes on his shoulder, listens to Knuckles wondering about the base. While Knuckles and the Chaotix enter the base, his father notes that the building was made a long time ago. Archimedes notices hesitation, asking him if the Dark Legion is a difficult subject to discuss. His father agrees, also noting that he wishes Knuckles didn't have to go through with dealing with the Dark Legion. Archimedes then states that he believes he is being too overprotective of Knuckles, which could lead to him getting killed. Locke doesn't agree, reminding Archimedes that Knuckles believes he is alone, but he actually isn't. He orders Archimedes to help Knuckles get out of harms way, knowing that Knuckles isn't ready to face the Dark Legion alone yet. The Chaotix arrive in the hangar bay of the base, surrounded by dozens of cloaked Dark Legion members. A message is heard by all, telling all members to proceed to the Great Hall. Not wanting to blow their cover, the Chaotix follow the procession of Dark Legion members to the Great Hall to see what is up. They arrive in the large hall, where Kragok stands on the stage. Vector wonders what is up, but is quickly answered as Kragok shows a Chaos Emerald, the reason they have arrived on the island. With the Chaos Emerald in their grasp, Kragok announces that their empire can return to its full glory, and believing Knuckles to have been burned to a crisp from earlier, nothing can stand in their way. Back in the past, Steppenwolf follows his ideals, arriving at the meeting place of the Dark Legion and walking up to its cloaked leader. The leader asks if he comes as a friend or a foe, while a Dark Legion assassin takes aim nearby. Steppenwolf announces that he comes alone, to work out an agreement between the other echidnas and the Dark Legion. Before the assassin can fire his weapon, the weapon itself instantly becomes hot, making the assassin drop it. The leader instantly notices this and takes out his own weapon. He fires, but Steppenwolf's training as a Guardian helps him to dodge. He then tosses a rock at the weapon, knocking it out of the leader's hands, then telling him that there is no need for weapons. The leader couldn't agree more, taking things personal, attempting to kick Steppenwolf aside for 'payback'. He misses, while Steppenwolf replies by punching him down. He is confused as to why the leader wants payback, as he takes off the leader's mask...revealing his cousin Menniker. Held at the neck by Steppenwolf, Menniker explains that it was Edmund's treachery that led to Dimitri's death. He spent many nights at the gravesite, until he noticed light from the Chaos Emeralds from where his father laid. He took it as a message from his father to continue his work. Steppenwolf tosses Menniker aside, telling him that if he continues his ways, it'll be disastrous for their culture. Steppenwolf takes the final step, using Chaos Control to rid of the Dark Legion into another dimension. Menniker is surprised to see his cousin using the same power as his father, as he is sucked into the dimension as well. The dimension closes with a bright light. With the Dark Legion's reign of terror ended, for now, Christopheles appears on Steppenwolf's shoulder. They both walk away from the meeting site, wondering what will happen in the future with the Dark Legion. With the Dark Legion watching on, Kragok takes matters into his own hands, grabbing one of Knuckles' knuckles with his robotic arm. Meanwhile, the Chaotix decide to take care of the others. Mighty takes off his cloak and grabs a floor panel, tossing some Dark Legion members aside. Espio, using his cloaking ability, attacks others, leaving the group baffled. While the Chaotix fight the Dark Legion, Locke is proud, but also notes his previous actions to stop Dimitri by using technology to send his base into space. Although it was against his ideals to not use technology, it was for the best to protect the Chaos Emerald. He meditates, and harnesses the power of the Chaos Emerald. With most of the Dark Legion members down, along with Kragok, Archimedes appears on Knuckles' shoulder. Nonetheless, more Dark Legion members arrive, so the Chaotix decide that they should escape. The Dark Legion members aim their guns at the Chaotix and fire. Locke is able to use his abilities to disable every weapon, leaving the Dark Legion even more baffled. With a window of opportunity, the Chaotix knock out the armed Dark Legion members with ease and prepare to escape. However, Kragok has gotten up and attempts to escape. Knuckles orders Archimedes to get the others to safety while he chases after Kragok to get some answers. During their escape, the base starts to overload from Locke's efforts, confusing the Chaotix. Knuckles eventually catches up to Kragok, but loses him as he arrives at three escape chutes. With the base starting to overload, he decides to let Kragok escape, for now, and get out of the base. He makes it to an escape chute in time, noticing that every single Dark Legion member has escaped as well, also hoping that the Chaotix got out. Arriving on the surface through the chute, he is greeted by the Chaotix, so he wonders if they know where Kragok and the Dark Legion escaped to. Charmy flies over, telling him that they didn't notice any of them, so they must've had an escape route planned. With a minor victory on hand, Knuckles tells the group that they will be prepared for them the next time they meet. 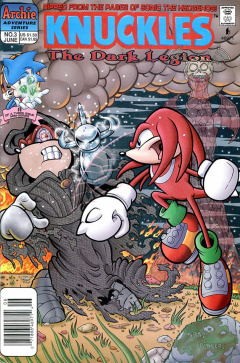 Although the Dark Legion saga was supposed to be a three-part mini-series, fan support for Knuckles prompted Archie to continue this series as a full comic series. This page was last edited on 28 March 2019, at 17:42.